October is almost over, and that means it's time to re-visit some of my favourite, most used products this month. To me, this time of year is all about red lips, spicy scents, purple nails and serious skincare regimes - as the temperatures drop down, my skin gets really dry and irritated, so daily moisturising is a must. Halloween is also around the corner, and although I'm not getting dressed up for it myself (I'll probably just spend the evening watching TV and binging on Pizza Hut! ), I have really enjoyed looking at other bloggers' outfits and makeup ideas. The main highlights of the month for me included the end of the daylight saving, which meant getting an extra hour in bed (always a good thing! ); and planning a holiday in Morocco with my boyfriend, where we will celebrate our anniversary in May. I suppose it hasn't been the most eventful month, but today's beauty favourites sure are exciting and worth talking about! 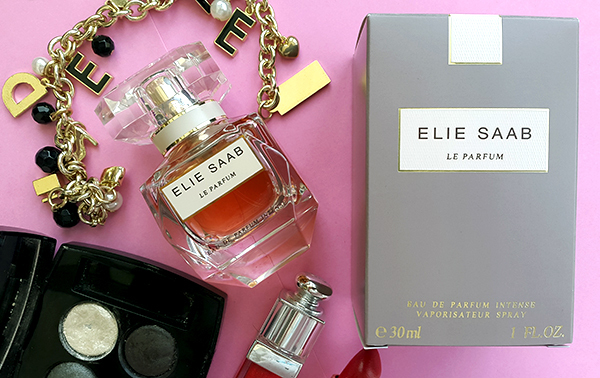 My 'perfume of the month' is the gorgeous La Parfum Intense by Elie Saab. This scent combines rose honey, amber and orange blossom; which together create one of the most luxurious, feminine and enchanting perfumes I've ever smelled. This scent is not too sweet, very floral, with a hint of spices and woods. I highly recommend La Parfum Intense for autumn wear, especially if you enjoy mature, elegant and rich fragrances. The price is roughly £42 for a 30ml bottle, and it is available across most major perfume retailers. Chanel Les 4 Ombres in Gabrielle has been, as you can probably tell from the picture, my most used eyeshadow palette this month. Aside from the top-shelf quality and great pigmentation, the shades are absolutely stunning - I'm really loving the shimmery grays and murky browns, which are great for any autumn look. The 'white gold' shade is perfect for highlighting, and has a bold, metallic finish. This palette is a little on the pricey side (£40, Boots), but it's definitely worth an investment if you're looking for something a little more high-end. 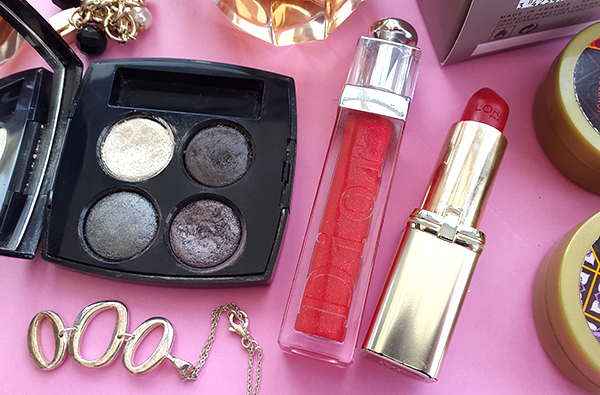 As for my favourite lippies, I've been enjoying the Dior Addict lip gloss in Iconic Red (£22, Debenhams), and L'Oreal Color Riche lipstick in Scarlett Creme (£6.99, Boots). They are both intense red shades, and work wonderfully when layered together. Dior Addict is a non-sticky gloss with a shimmery finish, whereas Color Riche is a creamy, hydrating lipstick with brilliant pigmentation and lasting power. I'll be the first to admit that for most of the year, I tend to neglect moisturising my feet. However, the unforgiving British autumn weather calls for some proper footcare. My feet get really dry; tucked away in heavier boots where they pretty much see never see any sunshine. 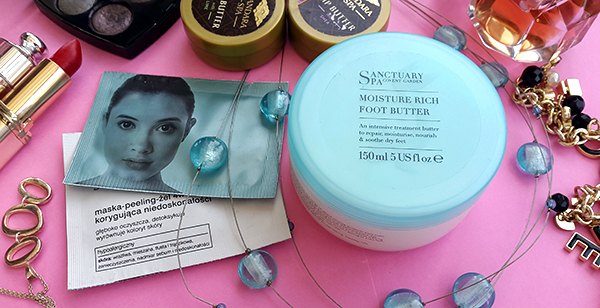 I've been loving this Moisture Rich foot butter by Sanctuary (£6, Boots), which is enriched with chamomile and aloe vera extracts to help soothe and regenerate tired, dry feet. As for my favourite skincare products, this deep-cleansing face mask by Tolpa has been doing a great job at keeping my skin looking fresh, clean and blemish-free. It's recommended especially for oily, acne-prone skin, and you can purchase it for £2.50 per sachet at m-shop.eu. I enjoy using body butters all year round (check out my top recommendations here! 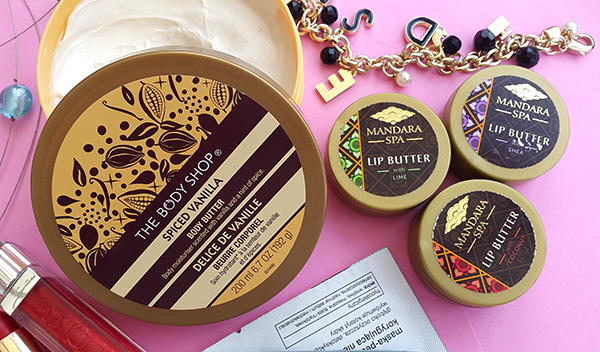 ), and my favourite this month has been the Spiced Vanilla body butter by The Body Shop (£5, TBS). It smells sweet, warm and spicy, with lots of creamy vanilla and a hint of cinnamon. It's also really hydrating and nourishing for the skin, which is important especially during the cold autumn season. And since we're already talking about good moisturising, these lip butters by Mandara Spa have been a life-saver for my dry, sensitive lips. They come in a variety of scents and flavours (including Lime, Shea and Coconut), and are a real bargain - you can pick up a full set for £6 at most supermarkets. The Liebster Award - my nominations! The Versatile Blogger Award - my nominations!